The STEM Professional Award recognise STEM professionals and researchers who are presently working in South Australia, either in the private sector companies or public sector agencies, and are making an outstanding contribution in their field. These Awards identify and promote professional excellence across the full spectrum of professional activities including research and development within STEM fields. 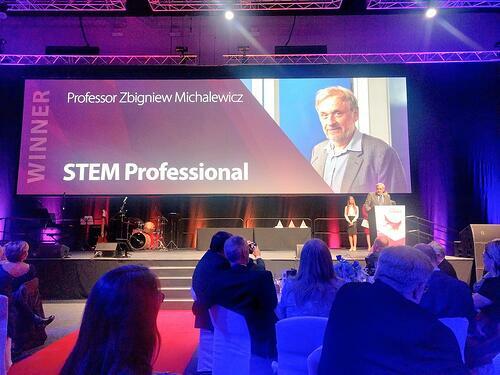 Internationally renowned Artificial Intelligence expert, Dr. Zbigniew Michalewicz has published over 300 articles and 25 books on the subject of predictive analytics, optimisation, and self-learning systems, which have been cited by other 10,000 authors. These include the ground breaking Adaptive Business Intelligence and How to Solve It: Modern Heuristics. Zbigniew is the Chief Scientist of Complexica and Emeritus Professor at the University of Adelaide. Zbigniew has over 35 years of academic and industry experience across numerous Artificial Intelligence technologies. He was the co-founder and Chief Scientist of NuTech Solutions, (which was acquired by Netezza, and subsequently by IBM), and the co-founder and Chief Scientist of SolveIT Software (which was acquired by Schneider Electric after becoming the 3rd fastest growing company in Australia). Both companies grew to approximately 200 employees before being acquired. During his time in the corporate world, Zbigniew led numerous large-scale machine learning and optimization projects for major corporations, including Ford Motor Company, BHP Billiton, Pfizer, U.S. Department of Defence, and Bank of America. Zbigniew Michalewicz also served as the Chairman of the Technical Committee on Evolutionary Computation, and later as the Executive Vice President of IEEE Neural Network Council.